She was sleeping soundly, smiling in her sleep while she dreamt of splashing water in the stream that gurgled next to her grandma’s house. Or was it the dream where she was chasing colourful butterflies in the garden or climbing the guava tree in the backyard that produced the sweetest guava with delicious red pulp inside! The ceiling fan spinning lazily above made the wild curly waves on her forehead tickle her cheeks, nose and eyes. When the persistent afternoon sun shone brightly on her face, little girl with pigtails sighed and snuggled back under the covers, blissfully embracing slumber. It was the clicking of copper, brass and steel vessels and the murmurs of gossiping ladies in the kitchen that woke her from afternoon’s nap. The gentle caress of brewing coffee in a large copper kettle and the aroma of spicy deep fried pakodas nudged her gently to open her heavy eyelids. Dragging her feet on cool marble floor with her favourite doll tucked under one arm and blinking her eyes to the golden glow of late afternoon sunshine streaming from high ventilator and windows, she blissfully inhaled the wonderful aroma of ground coffee beans and spices. The sight of her mother with her mother, standing in kitchen stirred the feeling of love and happiness. She ran and hugged her mother inhaling the heady perfume of her Pond’s talcum powder clinging to her neck. Mother gently lifted her daughter planting kisses on her daughter’s blushed chubby cheeks and placed her away from heat and close to window where the warm afternoon breeze tickled her face, the little girl continued to watch in awe the frenzy of activities in the busy kitchen. 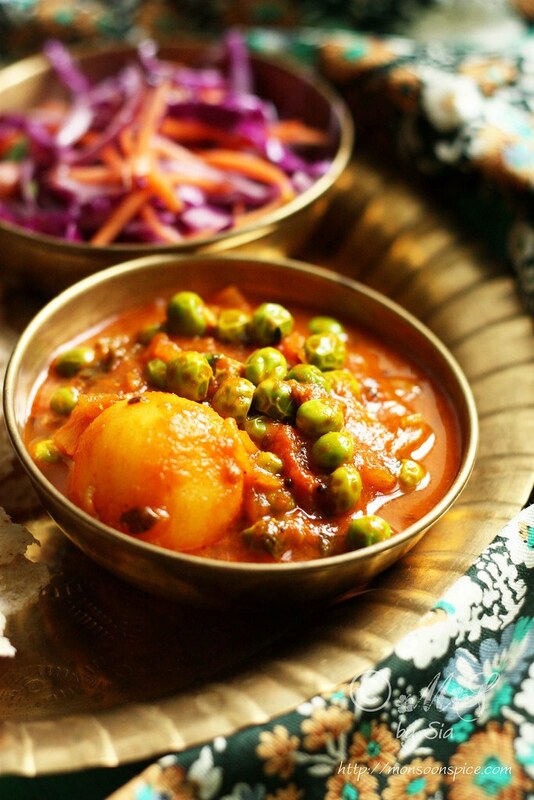 Aloo Matar ~ Potatoes and peas curry, a marriage made in heaven! As her mother and grandmother continued to gossip and exchange cooking tips, little girls in pigtails begged to help them with the cooking. Her mother and grandmother smiled at her eagerness to help and asked her to join them in preparing the dinner for the family. Little girl felt special to be made part of the whole cooking process as she followed her mother and grandmother to the large veranda in front of their house. Her mother was carrying a small sack that made her curious to know what’s inside the bag. For someone who was called the queen of impatience, little girl in pig tails tried really hard to contain hundreds of questions bubbling up in her brain’s surface in the fear that she will be asked to go and play with her sibling and cousins for being impatient! 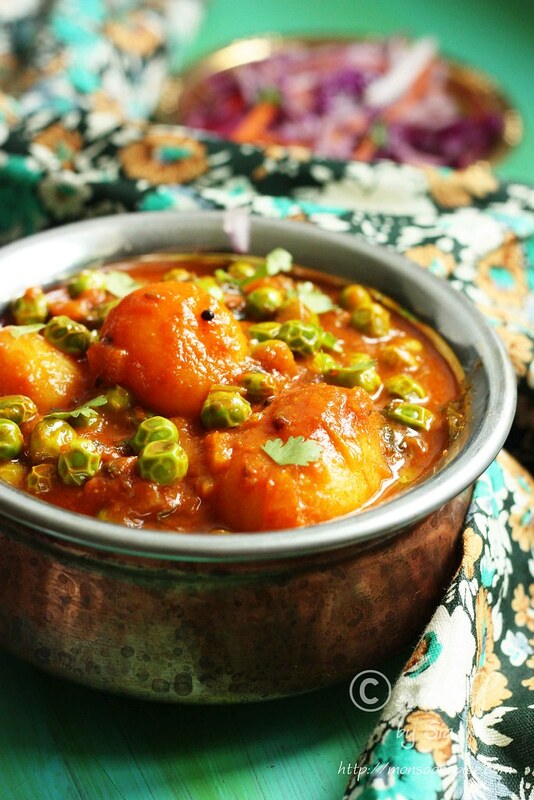 Aloo Matar ~ Simple to make and delicious in taste! Her patience was rewarded when her mother smiled at her and opened the sack to show the treasure inside that jute sack. 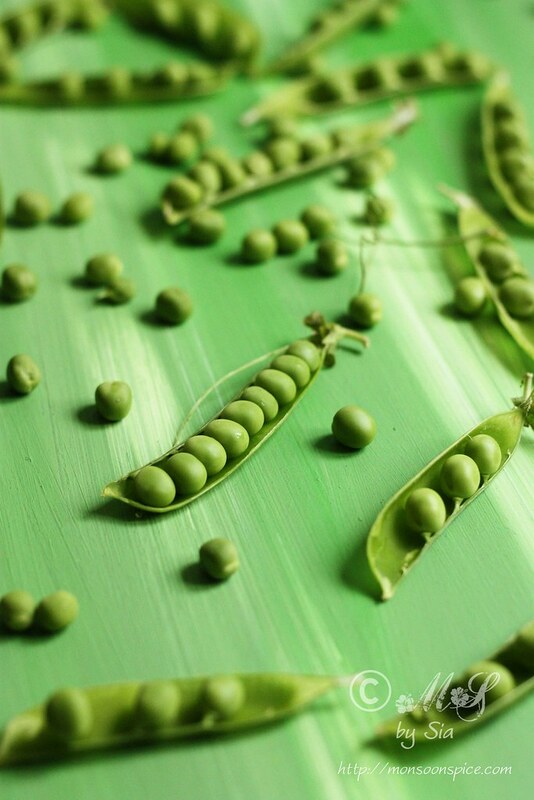 The emerald green pods came tumbling down containing with in them the precious treasures to little foodie’s delight! She was staring at the small hill of pods not knowing that what they hid with in their womb! As she perched on her mother’s lap, her grandmother picked a pod from the ground and snapped opened it with her thumb. The surprised and then delighted look on little girl’s face made them smile and marvel at the innocence of little kid. 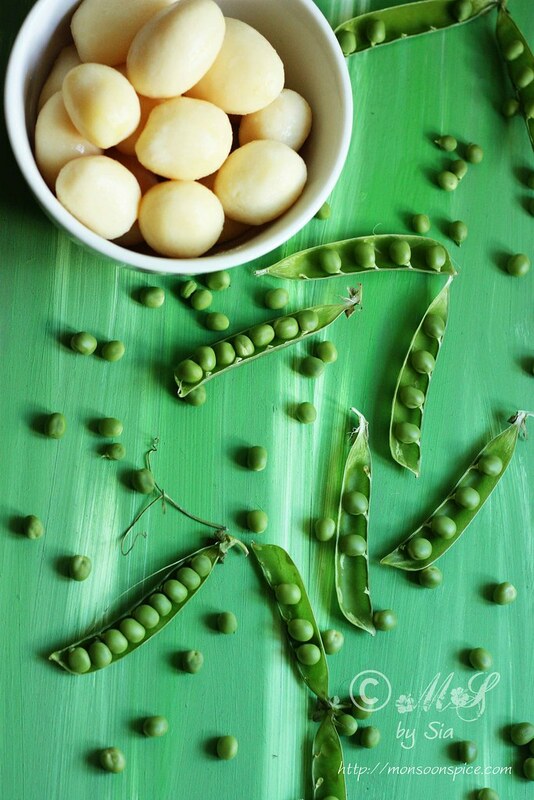 Soon three pairs of hands were shelling the peas... One pair of hand with wrinkles and lines on the palms that had seen many decades of hard life and gathered wisdom! The second pair of hands with long artistic fingers which made beautiful cloths for her daughters and tended their every need! And then there was the third pair of tiny hands as soft as butter with dimples showing the last bit of baby fat... Three generations of women, bonded by blood relation and love for one another! 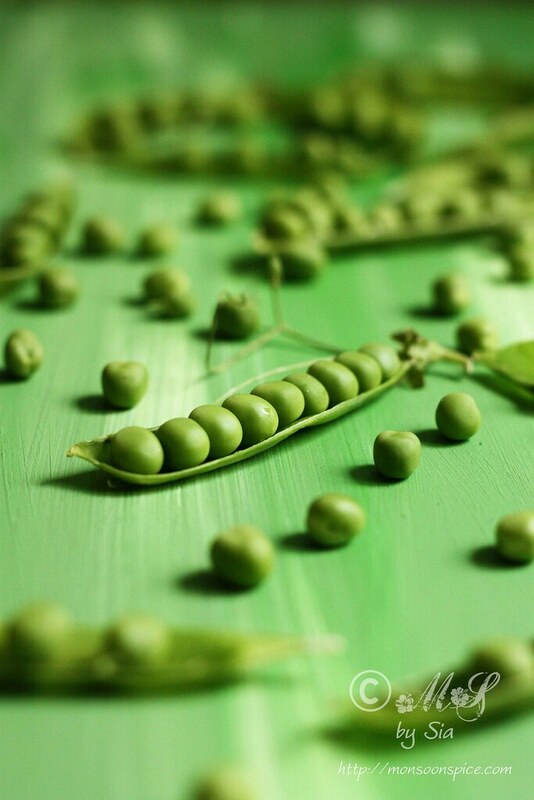 Just like these peas in a pod! 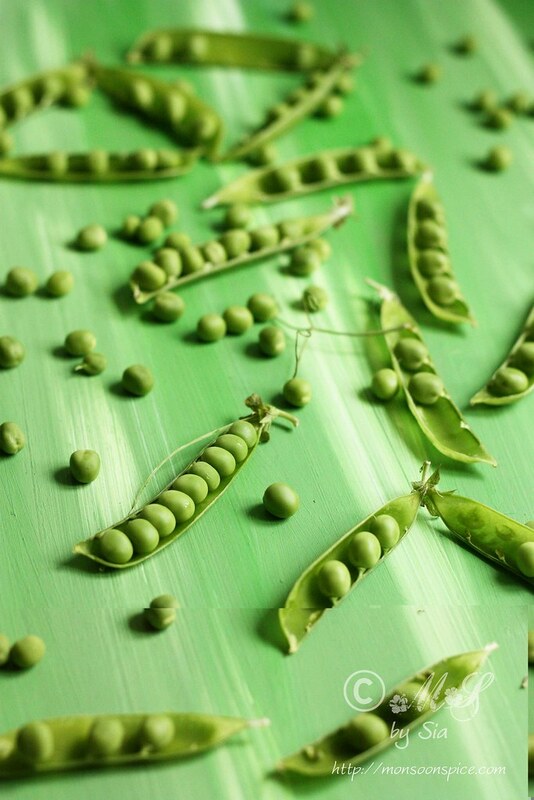 Peas in pods ~ Little beauties! Boil the baby potatoes till they are fork tender and peel their skins. If you are using large regular potatoes, cook them whole and peel their skins when they are cool enough to handle (read notes on how to cook in a pressure cooker). Cut the potatoes into 1 inch cubes and keep them aside until needed. Crush the peeled and roughly chopped ginger in pestle and mortar to make smooth paste. Similarly grind the quartered tomatoes to smooth puree without adding any water. Keep them aside until needed. Soak tamarind pulp in ¼ cup of hot water for 5-10 minutes. Extract the pulp using fingers and discard the fibres. Heat oil in a pan and add mustard seeds to it. When mustard seeds start to pop and splutter, add cumin seeds, fennel seeds, broken red chillies, and hing. Add finely chopped onion and garlic and fry them on medium flame till the edges of onions turn brown, about 3 minutes. Mix in tomato puree, crushed kasuri methi and ginger paste and give it a good stir. Let it cook for 4-5 mins on medium flame. Add red chilli powder, turmeric, coriander powder, cumin powder, tamarind extract and jaggary and mix them well. Add about 4 cups of water and salt to taste and bring the water to gentle boil. 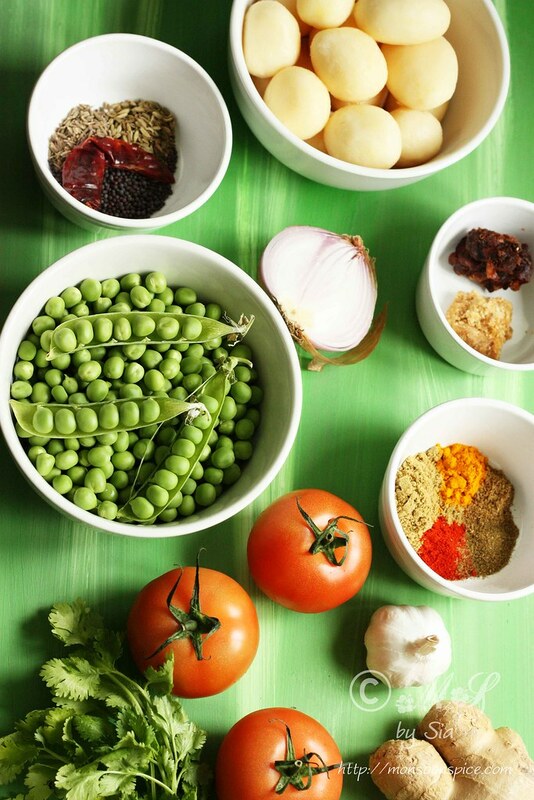 Add green peas, boiled potatoes and finely chopped coriander leaves and mix them well. Cover the pan and let it cook for 5 minutes on medium heat without disturbing. Open the lid and stir in garam masala. Reduce the flame to low and let the curry simmer for 10-15 mins. The starch from the potatoes will thicken the gravy as it simmers. So add more water if you find the gravy too thick to get desired consistency. 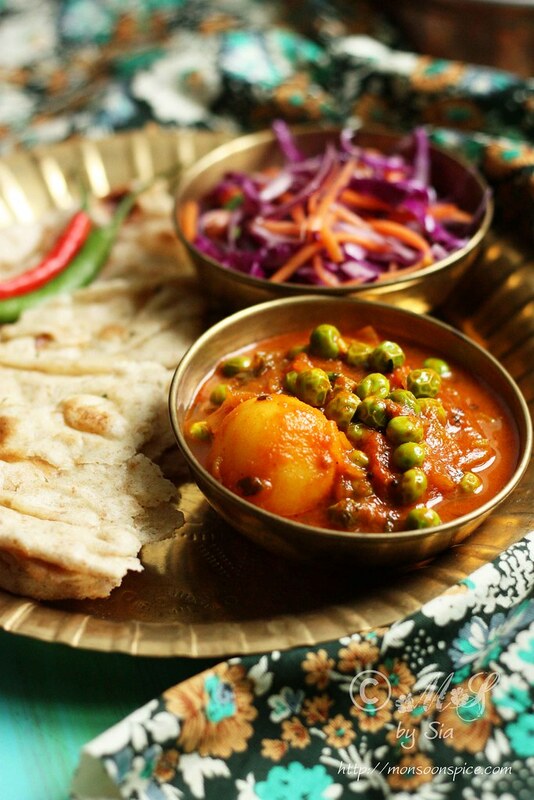 Serve this delicious Aloo Matar with any Indian flat breads (Whole Wheat Naan or Butter Naan or with any stuffed parathas) or plain/flavoured Basmati rice. If using large regular sized potatoes, the best way to cook the potatoes is in pressure cooker. To cook in a pressure cooker, place the scrubbed and washed potatoes in a container and place it in the pressure cooker with 1- 1½ inch high water in the pressure cooker. Do not add any water to the container with potatoes. Cover the cooker with lid and place the weight/whistle. Cook the potatoes on high flame for 6-7 minutes or 2 whistles. Lower the flame and let it simmer for another 7-8 minutes before turning off the gas. The large potatoes will take little longer to cook. Let the pressure release completely before opening the lid. Check if the potatoes are cooked through by inserting the sharp knife or fork. Once the potatoes are cool enough to handle, peel the skin and dice them in to 1½ inch cubes. Do not rinse the hot potatoes under running water or cold water as the potatoes will turn soggy. 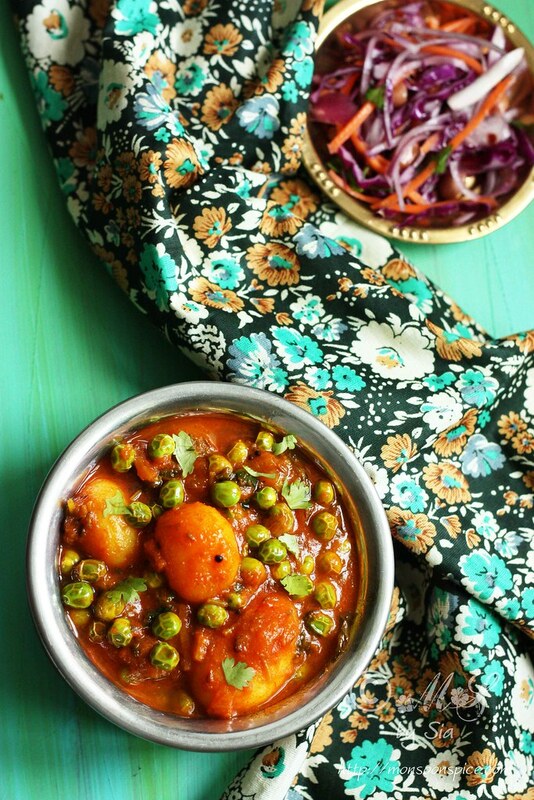 Extra tomatoes and fresh coriander leaves used in this recipe of Aloo Matar gives it a rather fresh flavour. Be generous with fresh coriander leaves as it is one of the main ingredients in this recipe and not just a pretty garnish. I highly recommend using fresh ginger paste instead of bottled or pre-made ones. Just peel the ginger and chop them roughly and then crush to paste using mortar and pestle or spice grinder. I personally like to use the tamarind juice extracted by soaking the tamarind pulp in hot water as it has the hint of sweetness to the sharp sour taste. But if you cant find the tamarind pulp, feel free to use tamarind paste or concentrate which is easily available in any good Asian stores or supermarkets. A beautiful curry! Very comforting. Detailed post.loved all your clicks . beautirull reciepe. And then, isn't it the best when you pass that on to your own child! Such a lovely background board you made. 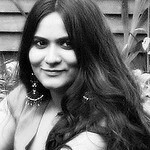 @Supriya Nair, thank you! 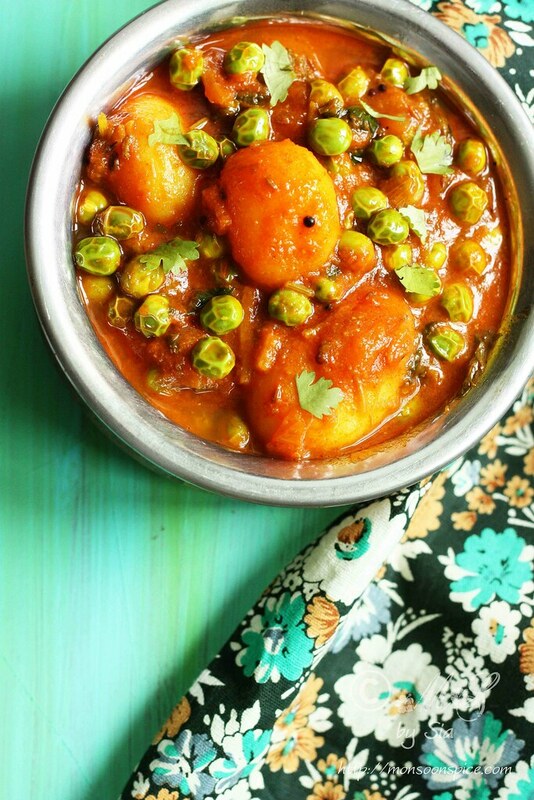 hope you like this version of aloo matar. Keep me updated. Awww such sweet memories. 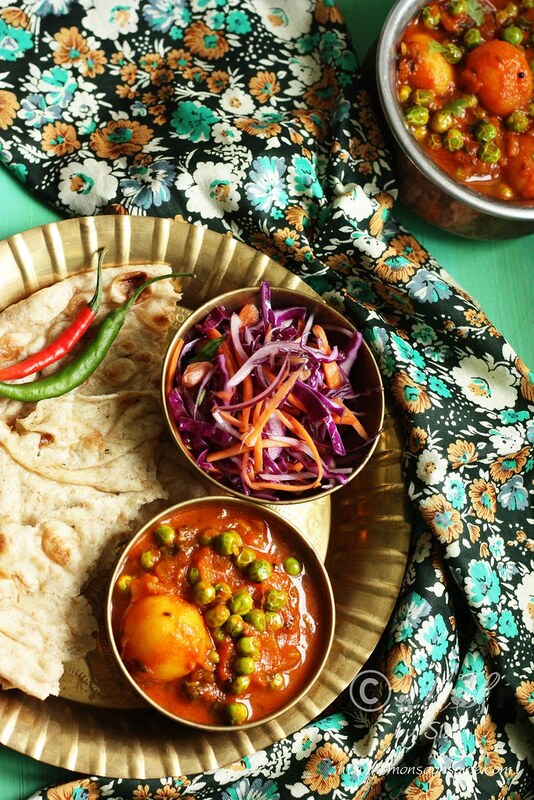 I really really love reading stories behind food and you transported me to a houseful of women, chattering cooking, smells, kids...lovely lovely and so your curry. Looks really nice, love your pictures. Lovely...... Tried it and loved it. Yummy....! Loved the recipe, thank you for sharing it. Hi Sia, decided to make your version of this tonight. Delicious! My husband hates fresh coriander (massive pain) but I substituted mint and it turned out well. Will just use a little less brown sugar next time and I think I was a bit light on the tamarind as with the mint it was a bit on the sweet side rather than a balance of the two. Our three year old loved it too especially with her buttery parathas.